I cannot believe that I did not do any recipe reviews in the month of December! That just shows how busy I was leading up to Christmas. To kick off recipe reviews for the New Year, I decided to do something fun! This is actually a recipe that I learned about in a Weight Watchers meeting several years ago, but I forgot about it. A few months ago, I found this recipe on Pinterest and I did not want to forget it again. I pinned it to my board and was determined to try it this time. Please take a moment to read the warning, before you attempt to make this recipe. The first time I tried to make this recipe it did not go well. I burned the popcorn and filled our house with smoke. It was awful. However, I gave it another shot. I only used 1/3 cup of popcorn kernels and only cooked my popcorn for about 2 minutes. Yes, I had lots of kernels leftover, but at least my popcorn was not burnt. Like me, you might have to try making this recipe a few times, before you figure out what works for you and your microwave. Don't be discouraged just open a window and keep trying. You will need a brown paper bag. *Popping Tip: Stop the microwave when the popping slows to one to two pops per second. You don’t want to burn your tasty snack. I sprayed my popcorn with butter flavored cooking spray. Next, I sprinkled Kernel Season's Popcorn Seasoning on top. This is so much healthier than some other microwave options. 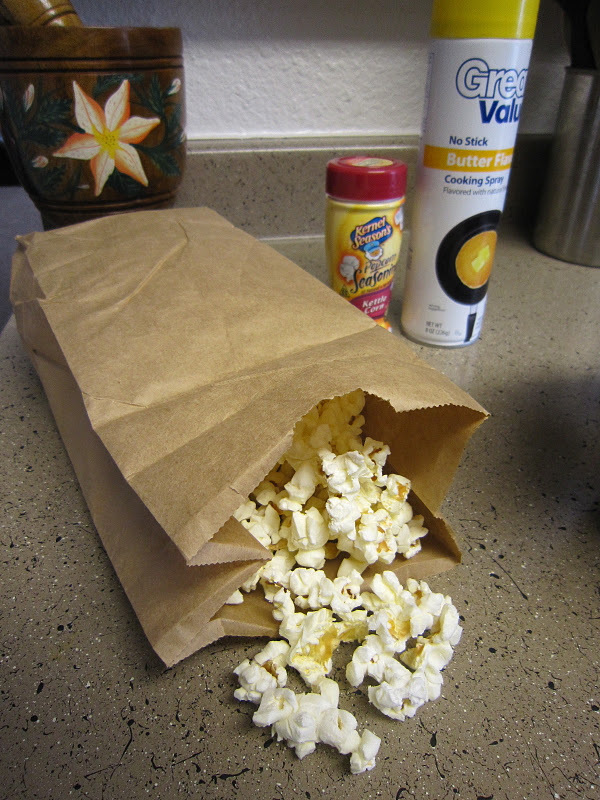 Step Two: Bag your popcorn. 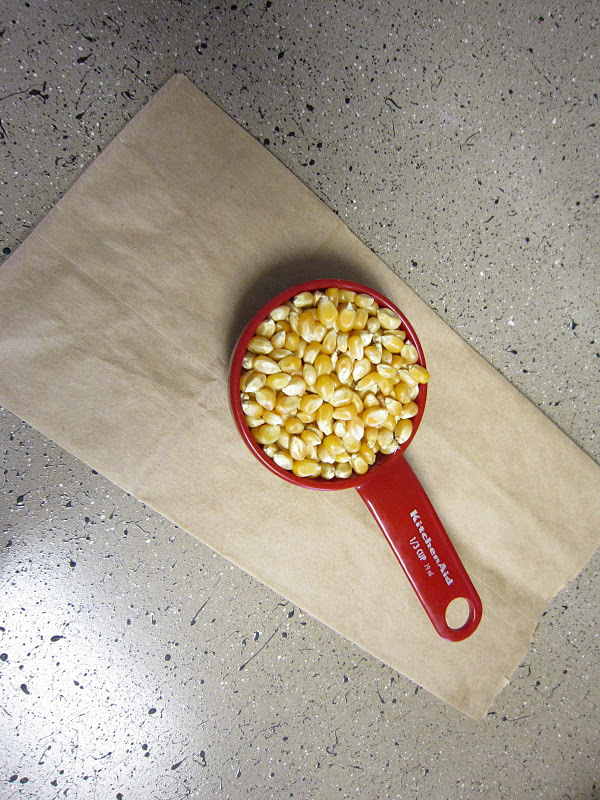 Add a 1/2 cup scoop of bulk popcorn kernels to your brown paper bag. Fold the bag over twice. Don’t use staples to secure the bag — this might spark in your microwave. Step Three: Pop in microwave. Stick the popcorn bag into your microwave. I set mine for 3 minutes on high. * Mexican: Add chili powder, hot sauce, and salt. * Kiss My Breath: Shake in onion powder and garlic powder — hold the kiss. * Cheese Please: Mix in Parmesan cheese with a little salt. * Sweet Tooth: A dash of cinnamon, a sprinkle of sugar, and a topper of honey. Now that’s money. * Classic: A shake of salt with a pat of butter. Hmm - that's a good idea. I usually use an air popper but sometimes I just don't feel like messing with it. My mom used to make popcorn in the microwave like this. I had forgotten all about this method. I'll have to try it. I even have paper bags that I bought many years ago for this purpose. I only used them a couple of times before Dave bought me the air popper. Wow, I definitely need to try this sometimes. I love microwave popcorn, just not all the other ingredients in it! Thanks so much for sharing! Great post to share! I copied the directions and will give it a try. What a great idea!! Plus you have the satisfaction of knowing EXACTLY what is in your treat! I'm over from inCourage, thanks for following me! I have found that if I lay the bag on it's side in the microwave instead of standing it upright, more of the kernels pop. I'm guessing it has something to do with a thinner layer of corn in the bag while laying on its side. 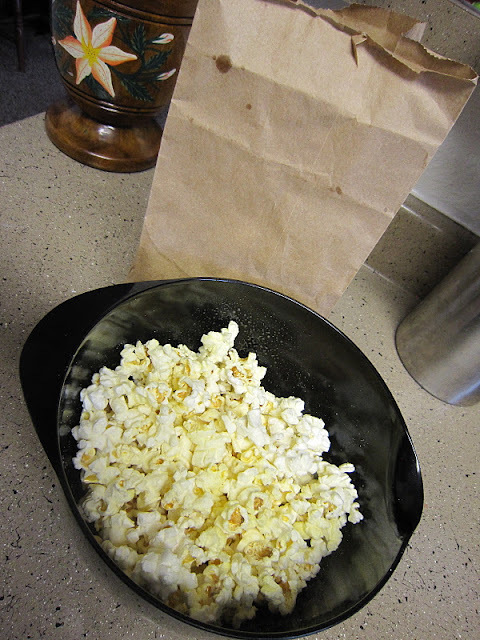 I still fold it over twice and crease the fold so popped corn doesn't get loose in the microwave.